With the abundance of snowy, sub-freezing weather, numerous sick days from all members of the household, and general lack of outdoor time, these peanut buttery bars have been baked several times in the past couple weeks. They have been prepared with both boxed brownie mix and from scratch. I can happily report that both ways are equally tasty, but the box is ready in a jiffy. Both baking methods are at the bottom of this post. When I made these brownies from scratch, I had no unsweetened baking chocolate on hand. So I whipped up my own using the substitution of 3 tablespoons unsweetened cocoa powder mixed with 1 tablespoon melted butter, per 1 ounce of needed unsweetened baking chocolate. 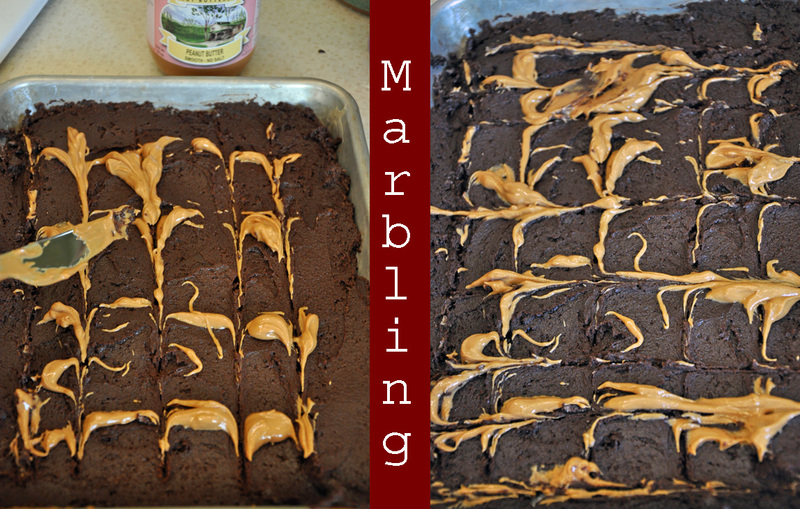 The best part of this recipe is that your marbling doesn’t have to be perfect – the baking process will cause your peanut butter to practically sink into the batter and make delicious pockets of peanut buttery goodness. Plus, you can cover any ugly spots with peanut butter chocolate candies. Be sure to use smooth peanut butter – if it is very thick you can stir in some water. However, I have found that using the all-natural, no additive peanut butter works very well, as it often has a higher natural oil content and is easier to spread and drip to make the marbled effect. I set my cabin fevered child to work decorating with peanut butter candies. Delighted, she only reserved a few to eat. 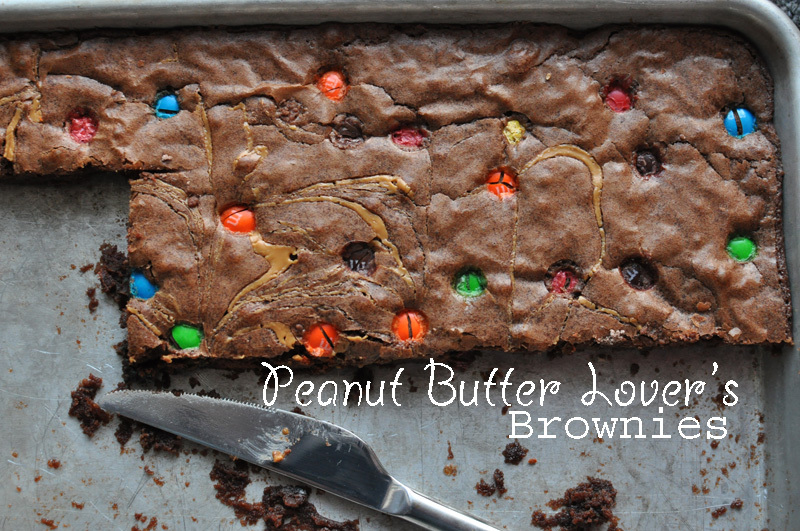 These brownies never last long in our household and the best part is how easy they are to make. Not a peanut butter fan? Swap out the peanut butter for caramel or butterscotch sauce. You are welcome! 1. 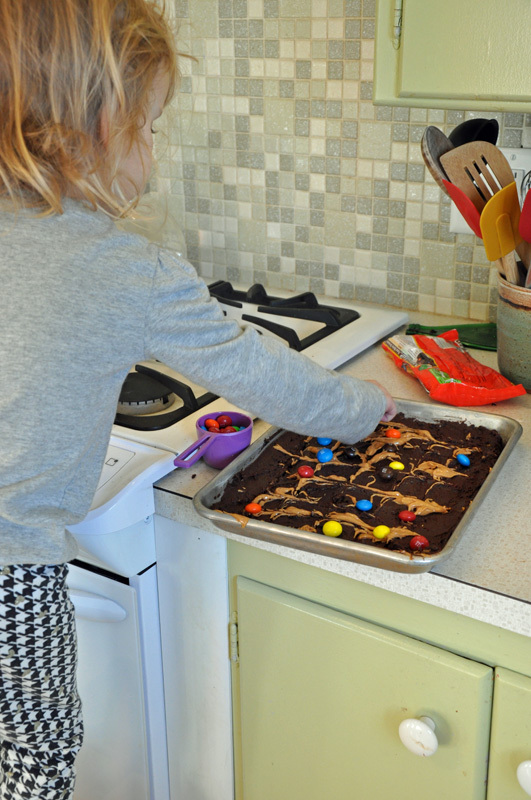 Prepare 1 box of brownie mix as directed. 2. Drop dollops of creamy peanut butter on top of batter. Use knife to draw vertical lines through batter, and then use knife to draw horizontal lines through the batter, creating a marbled look. Top with chocolate peanut butter candies. Bake as directed. 1. 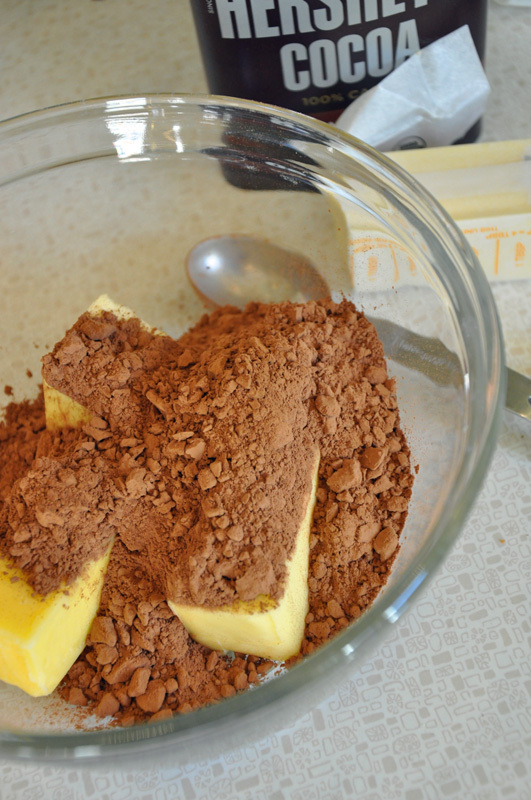 In a medium, microwave safe bowl, melt 1/2 cup butter and 3 ounces unsweetened chocolate, coarsely chopped (or substitute additional 3 tablespoons butter and 9 tablespoons of unsweetened cocoa powder). Stir well and allow to cool. 2. Meanwhile, grease an 8x8x2-inch or 9x9x2-inch baking pan; set aside. Stir 1 cup sugar into cooled butter mixture. Add 2 eggs, 1 at a time, beating with a wooden spoon after each addition just until combined. Stir in 1 teaspoon vanilla. 3. In a small bowl, stir together 2/3 cup all-purpose flour and 1/4 teaspoon baking soda. Add flour mixture to chocolate mixture; stir just until combined. Spread batter into prepared pan. Drop dollops of creamy peanut butter on top of batter. Use knife to draw vertical lines through batter, and then use knife to draw horizontal lines through the batter, creating a marbled look. Top with chocolate peanut butter candies. 4. Bake in a 350° oven 30 minutes for 8-inch pan or 25 minutes for 9-inch pan. Cool on wire rack. Cut into bars. 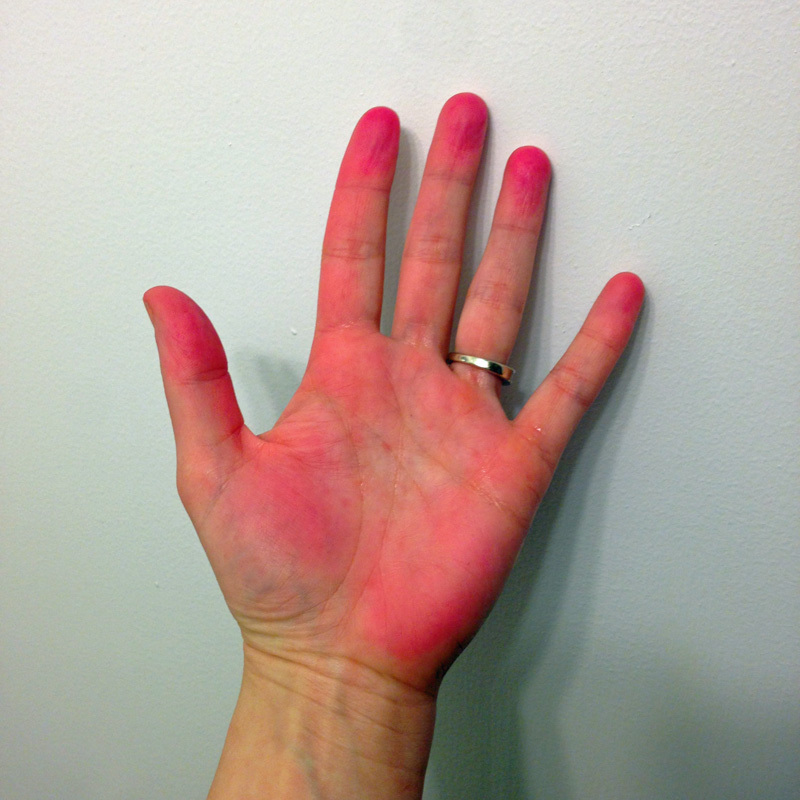 My hands are stained pink tonight – magenta pink. Why? Because of my love for hand-made Valentine’s and my daughter’s blossoming creative process. it all started with her asking me, “Mommy, when is Valentine?” I told her it was next weekend – 7 sleeps away and her reply was, “I need Valentine’s!” I asked her what she wanted to have on her Valentine cards and she said, “A horse with rainbow mane and tail, clouds, and standing on a rainbow.” Wow. It is like I was looking at my childhood self. I will be honest, I was kind of hoping to hear robot, frog, car, or robotic frogs in cars. I wasn’t expecting this! It was a few hours later I realized she was inspired by a card she received – I was slow to put the two and two together. Anyway, I got to thinking. I realized I had enough printmaking supplies to outfit her entire class in Valentine cards, and so decided to go with it. 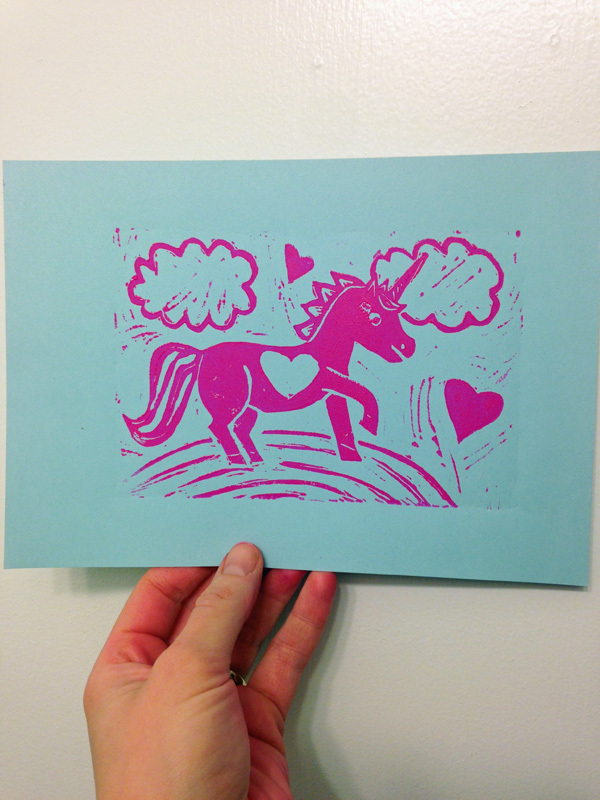 I have made quite a few Valentine’s Day cards myself in the printmaking media. 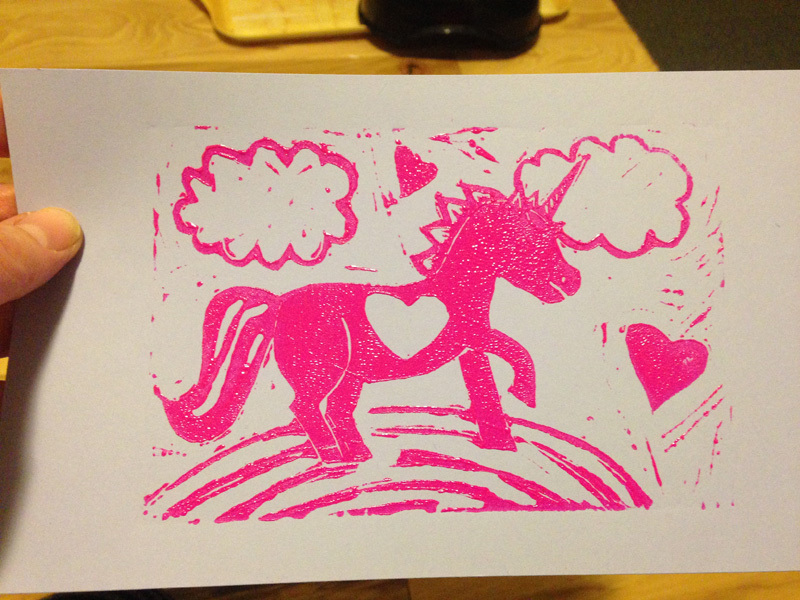 Printmaking is one of the easier ways to make hand-made but mass-produced artworks, if you ask me. 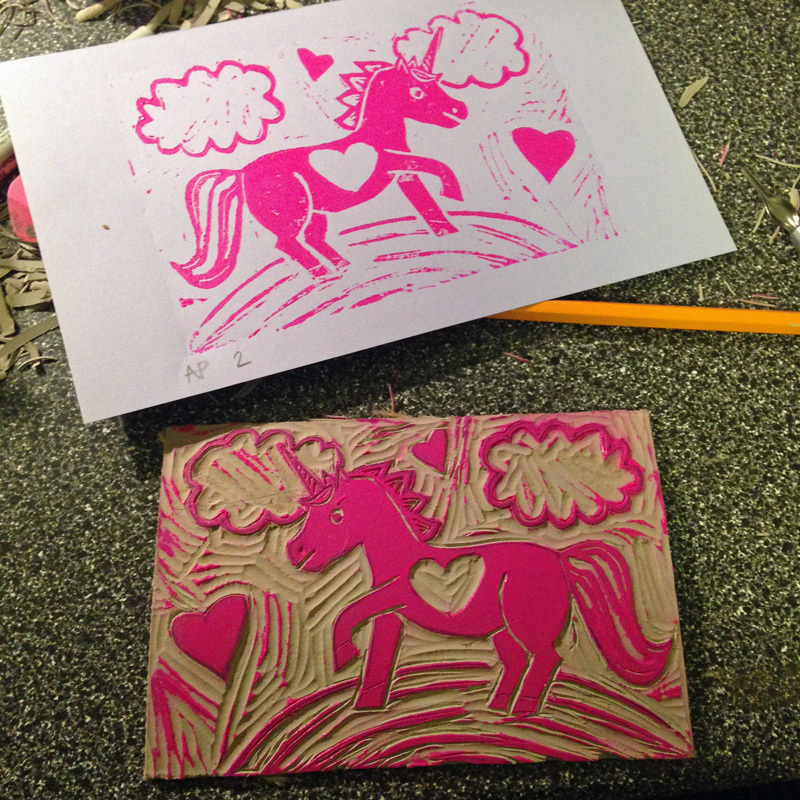 All you need are linoleum blocks, a cutting tool, a brayer, and ink. 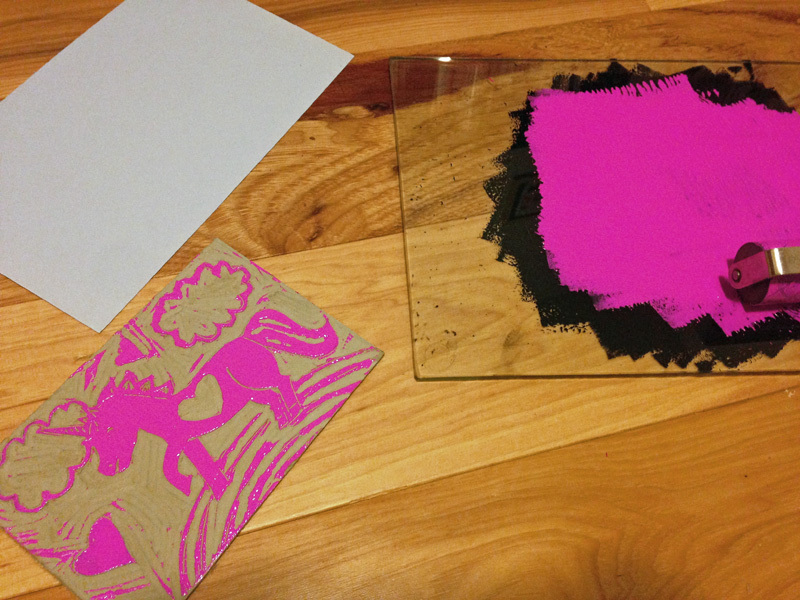 This Speedball Deluxe Block Printing Kit makes it so easy to get started on printmaking! 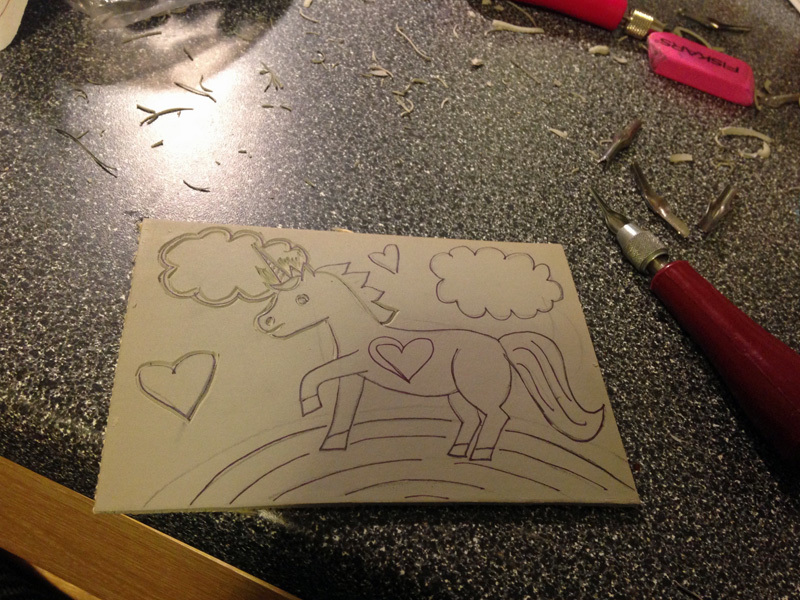 Here is the almost finished linoleum block. I kept this block smaller, so from sketch to this point only took me about an hour. 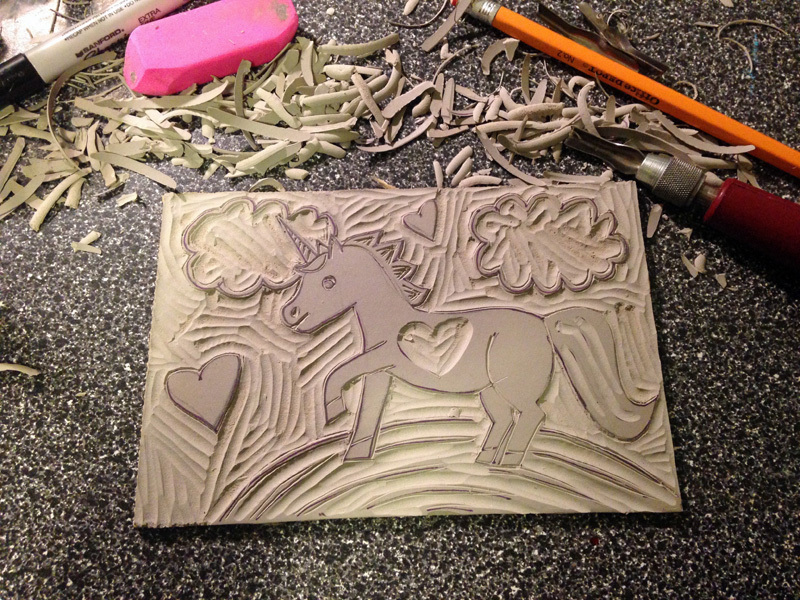 The trick is to use a warm iron to soften the block – this makes for easier carving. The next step is to make a test print, or an artist proof. These AP prints are crucial for finding areas that were not cut in the desired way the first time around. AP #1 shows a few areas to be improved upon. Where is the eye? Phew, looking better now (no pun intended). After the AP, I always wash the linoleum block and pat it dry. The leftover ink stains the block, making the correcting process that much easier. Oh, and it stains skin too, so be more mindful than I was during clean-up. However, this water-soluble ink cleans up easily in soap and water. The finished (for now) print. Greta and I will be collaborating even more on these prints tomorrow – I assumed she would add her own coloring to finish the rainbows. I can’t wait to see how she makes these prints her own, and I am excited to show you my plans for the adult version. My New Year’s Resolution of creating something at least once a week is chugging right along with great success. Both kids went down for a nap at the same time (!) yesterday, and I managed to get started on a still life drawing in color pencil, which I will show you at a later time. Greta came creeping down the stairs while I was about half way through this drawing. She climbed up on a stool next to me, still dazed from sleep, to see what I was working on. She proceeded to trace her finger over the areas I had already added color to, and ask me, “How you do this, Mommy?” It was then I realized that she didn’t remember the last time she had seen me work on my own art. 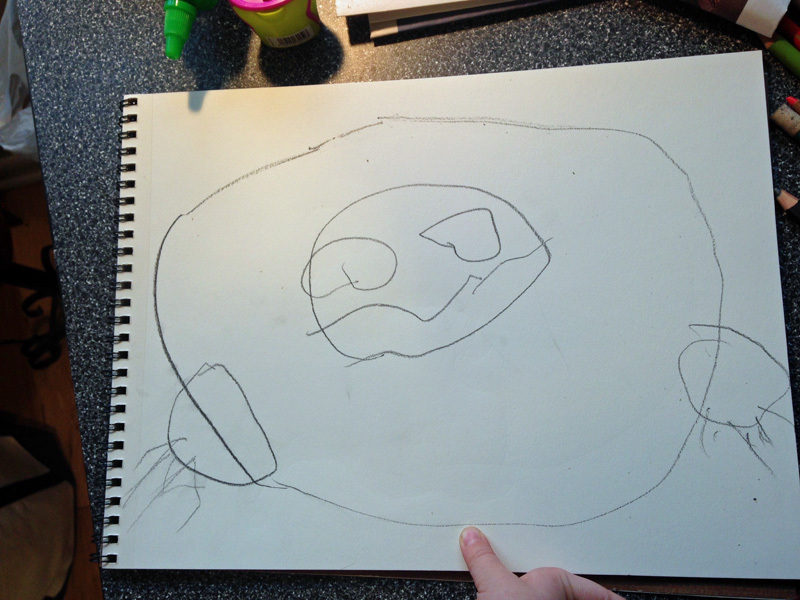 I have only worked on my own art after she was in bed, and I have drawn things for her at her art table, but she did not recall Mom making her own art. I explained to her that I make artwork on my own sometimes and that I was using color pencil and drawing from observation, meaning I was looking at a something while I drew it. She asked me if she could draw something in my drawing book with my pencils. I flipped to a new page and asked her what it was she wanted to draw. Her reply was, “A turtle.” Greta is just a little fascinated with turtles and even calls her brother a turtle. She was also a turtle for Halloween this past year, and we created a detailed papier mâché turtle shell, something which I now realize I never did get around to posting. 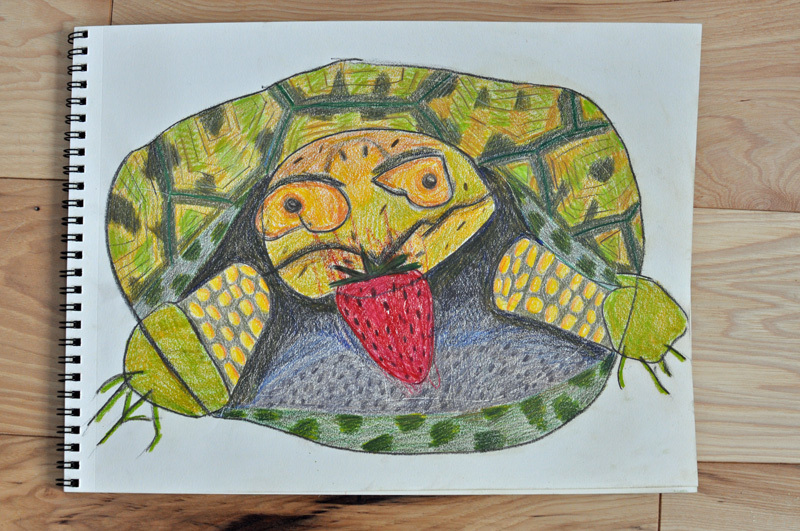 She then asked me to find an image of a turtle on my phone, because, “It is easier to draw when I look at it.” I found two turtle images for her to look at, one of which was eating a strawberry. My sweet 3-year old used my drawing pencil to draw this outline. Then, she told me I should color it in. I was a proud art teacher mama to see how big and confidently she drew this turtle outline! She politely asked me to add the strawberry and asked if she could color in that part. I obliged and colored in the remaining parts of the turtle. I have to say, this was one of the more exciting artworks I have done in a long time. I was thrilled to make this artwork with her and have been hoping for just this kind of collaboration for a couple of years now – ever since a friend directed me to the blog post on the Busy Mockingbird, on Collaborating with a 4-year old.